Each year, to celebrate St. Eloi, the patron saint of goldsmiths and jewellers, Perpignan showcases its iconic stone, the garnet, and the jewellers and craftspeople who work with the garnet. 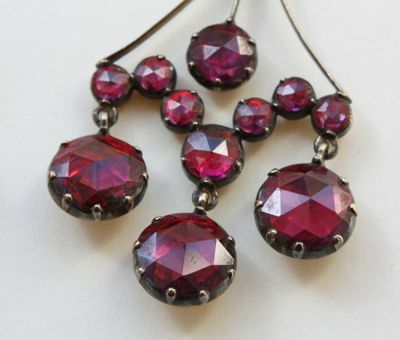 Present for centuries in the Catalan mountains, the garnet is a gemstone that symbolizes constancy and loyalty. Known for its deep red colour and sleek lines, it reflects the Mediterranean character of the city. Over the ages the garnet has become the emblematic jewel of Perpignan. For this reason, in November, on St. Eloi, the ‘confrérie Le Grenat de Perpignan’ and the ‘Institut du grenat’ organize a weekend of festivities around this jewel. A variety of events will bring out that Perpignan sparkle, including the famous procession of the Confrérie du Grenat (Brotherhood of the Garnet) – a parade of jewellers and craftspeople in historical costumes, starting from the Palais de Congrès, and heading for the église Notre Dame de la Réal, where a solemn ceremony of ‘intronisiation’ (investiture) will take place. 10h : Meeting in front of the Palais des Congrès. 11h : Catalan Mass at Eglise Notre Dame La Réal. 12h : Traditional dances and sardanes – place de la Loge. 15h30 : Visit of the Garnet jewellry expo with demonstration of traditional jewellry making.